Section 9 powers Warwick and Monroe Woodbury both crowned individual champions at Thursday’s Massapequa Holiday Tournament in Long Island. With a very well-balanced performance (only 1 champion, but 10 top-4 finishers), Section 11’s Connetquot won the team title outscoring runner-up Massapequa and Section 1 power Fox Lane. Monroe Woodbury finished in 5th while Warwick, who only brought a partial team, finished 8th. Click here for complete brackets. In one of the more impressive individual performances of the day, Warwick senior Justin Corradino won the title at 120 pounds, perhaps the toughest weight class in the tournament. Corradino earned the title by defeating 2010 NYS Champion Mark West of Hauppauge in the finals. West made it to the finals by defeating Sean McCabe of Connetquot. McCabe finished 3rd in NYS last year. Other Warwick place finishers were Shane Connolly (4th @ 138), Conor Leavell (2nd @ 195), and Chris Giordano (4th @220). Not to be outdone by their Section 9 rival, Monroe Woodbury crowned two individual champions and had a third finalist. Crusader AJ Voelker made a successful drop to the 145 pound weight class earning his title by defeating Division-Levittown’s Jon Maldonado 7-4. Sophomore sensation Rob Kelly continued his impressive season by capturing the 195 pound title with a 5-2 victory over Warwick’s Connor Leavell. Monroe Woodbury freshman Vinny Vespa made it to the finals at 99 pounds before losing by pinfall at the 5:39 mark to Steven Sewkumar of Long Beach. Sewkumar is the top-ranked 99 pound wrestler in Long Island’s Section 8. Other Crusaders who placed in the top 4 were PJ Smoot (4th @ 106), Brandon Lewis (4th @ 126), John Vandercliff (3rd @ 152), Evan Psathas (3rd @ 170), and Jorge Vasco (3rd @ 220). Section 9 was very well represented in what proved to be an extremely competitive and evenly matched Mid Hudson Tournament on Tuesday and Wednesday. In the team race, Cornwall finished second to host Arlington. 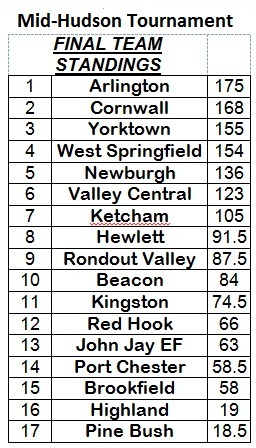 Other Section 9 teams that finished in the top ten included NFA (5th), Valley Central (6th), and Rondout Valley (9th). Kingston, Red Hook, Highland, and Pine Bush also had wrestlers compete in the tournament. Four Section 9 wrestlers, two from Cornwall and two from Kingston, took home individual titles. Cornwall’s TJ Kreider capped off a dominating tournament by defeating NFA’s Sean Foshini for the crown at 113 pounds. Kreider pinned Valley Central’s Hussain Hasan at the 5:50 mark in their semifinal match-up. Hasan defeated teammate Jimmy Clark, who only lost 8-6 OT to Foshini in the semis, to finish 3rd. The Green Dragon’s other individual title came at 132 pounds where Luke Roth defeated Ketcham’s Mike Morabito via injury default. Roth began Wednesday in impressive fashion by defeating Rondout Valley’s Colin Dimler by a 8-2 margin. He then went on to beat Rob Rosenberg of Hewlett (Section 8, Long Island) by a score of 6 to 3. Dimler wrestled back well to take 5th place. Kingston’s Deon Edmond navigated his way through an extremely tough 195 lb. weight class to take home first place honors. After pinning Valley Central’s Krajl Haxhaj in the first round, Edmond defeated Arlington’s Matt Day 3-0 in the semis and Beacon’s Deondre Pierce 5-4 in the finals. Seth Stauble gave Kingston their second individual title when he pinned Yorktown’s David Varian at the 4:56 mark of the 285 pound final. Varian reached the final by squeaking out a victory over NFA’s Terrance Cheeks 2-1 in 2OT. Stauble pinned his way through the bracket by also securing falls over Will Brammer of Red Hook and Vinny Guiel of West Springfield. Cheeks finished 4th for the tournament. Washingtonville 2nd at Pearl River; Colin Casey Champ at 170! Washingtonville finished second out of 14 teams at Wednesday’s Michael O’Connell Wrestling Tournament in Pearl River. Section One’s Tappan Zee won the team title with 147 points to Washingtonville’s 112.5. The Wizards placed eight wrestlers in the top four including the champion at 170, senior Colin Casey. Also placing for Washingtonville were Bryan Mongiello (2nd @ 120), Luke Harrison (4th @ 132), Mark Milisci (3rd @ 138), Francesco Pichardo (4th @ 152), Andrew Bragado (4th @ 160), Sam Weinger (2nd @ 220), and Stephen Melgar (3rd @ 285). Ellenville and Tuxedo also competed in the tournament. Tuxedo’s 106 pounder Dylan Lynn finished 2nd losing an OT decision in the finals. Congratulations to all! Raccioppi Champ, 5 Other Warriors Place at NJ Tourney! 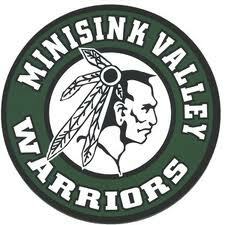 Minisink Valley traveled into the wrestling rich state of New Jersey on Tuesday and placed 6th in the team race against some top-notch competition at the Cougar Classic held at Kittatinny High School. The Warriors were led by freshman Michael Raccioppi who won the 106 pound weight class and remains undefeated on the season. Also placing for the Warriors were Mason Rambrose (2nd @ 113), Devyn Fennell (4th @ 145), Anthony Sannella (3rd @ 182), Luke Durland (4th @ 195) and Shane Hanlon (3rd @ 220). * Derek Valenti – NCAA D1 All American at University of Virginia! Posted on December 27, 2011 November 19, 2014 Author Mike CareyCategories UncategorizedTags high school wrestling, NY wrestling, section 9 wrestling3 Comments on Raccioppi Champ, 5 Other Warriors Place at NJ Tourney! Fresh off their debut as the 20th ranked D2 wrestling program in New York, Onteora headed upstate on Friday and successfully defended their title at Oneonta Midnight Madness Duals. Christian Smith, Kyle Vanvalkenburg, Austin Weigel, and Dustin Mackenzie all went 4-0 for Onteora. Congratulations to Lou Chartrand and the Onteora wrestling program! NFA defeats Cornwall 40-27 in historic dual! For the past 23 years, head wrestling coaches Jeff Cuilty of NFA and Don Blaine of Cornwall have watched their respective teams go to battle dozens of times. On Thursday, however, they faced each other for the first time as NYS Wrestling Hall of Fame members. In fact, is was one of the few times ever that Hall of Fame coaches have squared off in a dual meet in New York State. 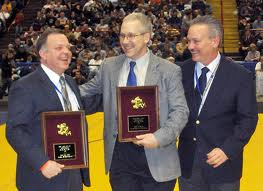 Coach Cuilty and Coach Blaine, along with long-time Section 9 referee Wayne Carroll, were inducted into the HOF during the NYS Championship Tournament held in Albany last February. On the strength of 4 pins and 4 forfeits, Warwick, the #3 ranked team in NYS, dominated Port Jervis 54-25. The dual meet, however, did feature two marquee match-ups between ranked wrestlers; both matches lived up to their billing. At 145 pounds, Warwick’s Shane Connolly defeated Port’s Dylan Muller by a score of 2-0. Connolly, a 4X Section 9 champion, scored the only points of the match with a takedown at the end of the first period. At 160 pounds, Warwick’s Ryan Bedross narrowly defeated Travis Edwards 3-2. The other potential headline match could have taken place at 152 pounds where many in attendance anticipated a showdown between Warwick’s Kyle Weirzbicki and Port’s Bret Sauschuck. Weirzbicki was injured, however, and did not dress for the dual. Click below for complete boxscore. Results from Wednesday’s action as I get them….. Tune into kjbroadcasting.com tonight at 7:00 for another installment of The Section 9 Wrestling Talk Show. Tonight’s guest are Port Jervis Coach Eric Hartmann as well as PJ wrestlers Bret Sauschuck and Travis Edwards. Mike and Tim will review the week that was, preview the week that will be, and, of course, release their new rankings!